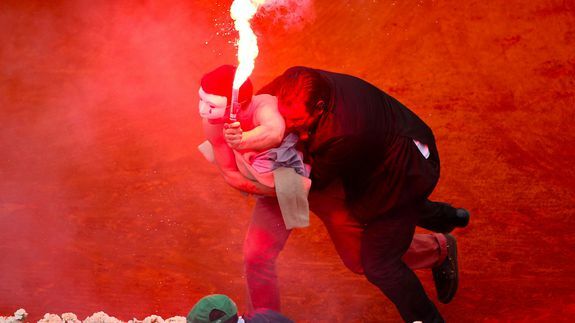 A shirtless, flare-wielding protester wearing a mask jumped from the stands onto the court during Sunday's final match at the French Open. The match between Rafael Nadal and David Ferrer was delayed for several minutes as the protester was tackled and apprehended. Nadal later went on to defeat Ferrer 6-3, 6-2, 6-3, claiming his eighth French Open title. According to the BBC, the protestors were angered over France's recent decision to legalize gay marriage. Protests and counter-protests have occurred across the country since the decision. The country's first gay marriage, held last month, required tight security in the face of potential violence.